Place potatoes in a stock pot with enough water to cover. Boil potatoes in water until tender. Let cool then peel. Pass potatoes thrugh a strainer or mash them with a potato masher. Mix well. 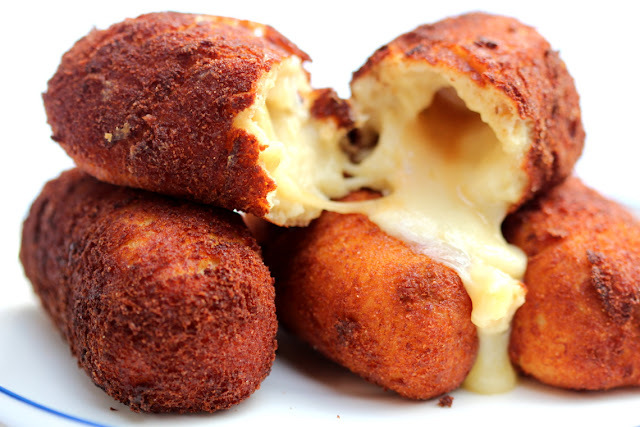 Take portions of the mixture in scoops then form into small croquettes. Coat each piece with flour. Dip in slightly beaten egg then roll on a plate full of breadcrumbs. Heat cooking oil in a frying pan. Deep fry potatoes in hot oil until golden brown. Remove with a slotted spoon. Serve while hot. End.